NEW BRITAIN - There will be no series sweep for the New Britain Bees. 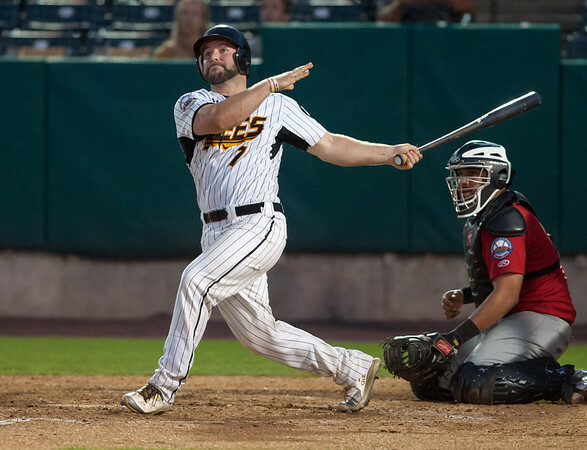 A day after the New Britain Bees engineered an extra-inning comeback to take the first two games of their four-game series, their offense fell silent Wednesday night. New Britain hitters didn’t collect a hit after the sixth inning and fell to the last-place Road Warriors 8-1 at New Britain Stadium. Kelvin Villa was strong on the mound for the Road Warriors. In six innings of work, the left-hander gave up just one run and all three of the Bees’ hits. He also struck out three and walked five. New Britain’s only run came in the third inning on an RBI-single from Jovan Rosa. But the Bees found themselves having to play from behind early. New Britain sent out Matt Quintana to start for the first time since he came over from the Empire League. The outing didn’t go as planned as he gave up four runs on six hits in just three innings. The one bright spot for New Britain was the bullpen, which has been the strongest part of the team all season. Sam Gervacio and Jim Fuller logged some necessary innings, combining to give up one run on two hits from the fourth inning through the seventh. The only arm to struggle out of the pen was Elvin Ramirez, who gave up three runs in the ninth after a scoreless eighth inning. The loss puts New Britain’s second-half record to 20-20. With 23 games left in the regular season, the Bees still sit in third place in the Liberty Division standings behind the Long Island Ducks and Somerset Patriots. They are seven games behind the Lancaster Barnstormers in the wild card standings. Because New Britain won the first two games in the series, the team is still in a position to take the series with the Road Warriors if it can win tonight. With Rainy Lara set to get the start on the mound, the Bees are confident they will be able to get the job done. Posted in New Britain Herald, New Britain Bees on Wednesday, 22 August 2018 22:41. Updated: Wednesday, 22 August 2018 22:43.